Interestingly, the common term “toxic mold” is a misnomer in that molds are absolutely not toxic or poisonous in and of themselves. However, molds can be toxigenic, meaning that under certain conditions they produce toxins as byproducts, called mycotoxins, which present hazards to human health and wellbeing. The research on mycotoxins is ongoing, with a good deal of mystery still existing about their inherent properties and effects on people. Currently there are over 200 known mycotoxins(and counting) which are produced by many common molds that can exist in your home and outdoors. There is historical evidence of the presence of mycotoxins as far back as the time of the Dead Sea Scrolls, but the chemical nature of them was not known until recently. The most commonly observed mycotoxins today which are known to have adverse effects on humans and livestock are: aflatoxins, ochratoxin A, patulin, fumonisins, zearalenone and nivalenol/deoxynivalenol. The mold that produces the mycotoxins typically grows on food stuffs such as nuts, spices, cereals, and dried fruits, but can also arise indoors on surfaces with high cellulose content such as wood, fiberboard, gypsum board, paper, dust, and lint, particularly in water-damaged or generally humid and damp environments. Several studies have detected mycotoxins in samples from walls, air ducts, and ceiling tiles. When occurring on food, the mycotoxins are very chemically stable, occurring at any time from pre-harvest, post-harvest, during storage, or on/in the food itself under the right conditions, even surviving food processing. The production of mycotoxins by molds is still poorly understood, but it is thought to be affected by conditions such as the strain of mold, genetic susceptibility of the host commodity and plant, moisture content, temperature, microbial population, and aeration. Typically, a higher level of water activity is needed to produce significant quantities of mycotoxins. The risk is highest for homeowners when multiple consecutive episodes of water damage occur in the home, promoting mold growth and mycotoxin synthesis, followed by drier conditions that allows spores produced by the mold to be fragmented and liberated into the air. The mycotoxins are carried by the spores through the air, which can be detected in air samples at high spore concentrations. The spores themselves are very hardy and can survive harsh conditions that the mold cannot. When they land on a moist surface, new mold can start to grow. Or, as they float through the air in search of breeding grounds, they can come into contact with people via inhalation, ingestion, and skin contact. Inhalation is the most common method of contact leading to adverse health effects. 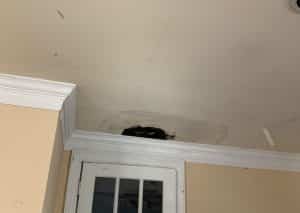 Black mold has gained a reputation of the classic “toxic” mold, which we have already learned is an inaccurate descriptor for any mold. The species of mold known as Black Mold is Stachybotrys chartarum, with the informal name based on its dark color. However, toxigenic mold can be of any color, and Black Mold does not always produce toxins (although if it is producing mycotoxins, it does produce particularly high quantities compared to many other molds). There are over 100,000 mold species, making it very unlikely that Black Mold is actually the specific culprit in any given case of mycotoxin presence. The most common types of mold found indoors include Cladosporium, Penicillium,Alternaria, and Aspergillus, whereAspergillusand Penicilliumproduce relatively low concentrations of mycotoxins. Determining whether or not any given mold is producing mycotoxins requires testing, and cannot be stated with certainty just by looking at the mold. Thus, all molds should be treated equally as potential health risks. Additionally, when mycotoxins are present, usually some form of toxigenic mold accompanies it, but this is not always the species of mold originally responsible for producing the mycotoxins. Identifying all molds present is important for determining the severity of damage caused by the various molds, but chemical analyses are necessary to establish the presence and source of mycotoxins in a given moldy material. In the presence of mycotoxins, there is potential for exposure from humans and animals in the vicinity, but this, too, requires testing as the presence of mycotoxins does not guarantee exposure or disease onset. and other more severe symptoms for advanced onset. These symptoms may be easy to confuse with similar signs of other common diseases, but the appearance of these symptoms in several people with no obvious connection to other agents can be an indicator that mycotoxins from molds are the culprit. To be sure of a diagnosis of a mycotoxicoses, it is necessary to perform proper testing for mycotoxins via sampling, sample preparation, and analysis. In the world of the perpetually elusive and mysterious mycotoxins, much research still needs to be done. It is difficult to immediately tell if a mold is producing mycotoxins, what quantities it is producing, whether humans have been exposed, and what the effects of exposure can be. Vigilance in sample testing and removal are the only ways to identify and prevent the release of mycotoxins and their subsequent interaction with vulnerable people living in their presence.